At the foot of South Africa is a spectacular 150 mile journey through the narrow band of land between the Indian Ocean and the mountains. Travellers are seduced by a floral paradise, sands that are wide and white, the double majesty of elephants on land and whales close to the shore, a world record bungee jump, forest walks and one of the most unhurried towns on the continent. You could drive the Garden Route in a day, but I wouldn’t recommend it. Stop in a place like Mossel Bay, with the world’s mildest year-round climate, after Hawaii. Or Plettenberg Bay, for glorious, golden beaches. It’s very accessible, this jumble of lush plains, wooded cliffs, sharp-nosed headlands and coastal wetlands cut by the estuaries of rivers sweeping down deep gorges. And dramatic little cameos, such as the Knysna Heads, where the sea crashes spectacularly through a narrow rocky gap. many places to enjoy this abundant colour show. For the gala performance, visit the De Hoop Nature Reserve and Tsitsikamma National Park. 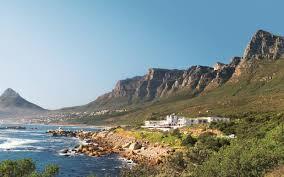 The Garden Route coast is one of the best, and easiest, places in the world to see whales and dolphins from the land. Robberg Beach is one of the top locations for exhilarating water acrobatics from the southern right whale. Look out for 60 tonnes of raw power within splashing distance of the shore. The Hermanus Whale Festival is held in October to celebrate the return of the great beasts to the waters of Walker Bay. If you want to see them at closer range, go to Plettenberg Bay, where they organise whale-watching trips by boat. For the finest view of all, take one of the light aircraft trips from here. It is the perfect antidote to the urban, flat-out, fast-lane lifestyle. The little coastal town of Sedgefield has been named South Africa’s first Cittaslow — literally “slow city” — by an Italian organisation. It joins a list of 147 Cittaslow towns in 24 countries, selected for their record in looking after their residents, visitors and environment, and for avoiding the sameness that afflicts too many towns. Sedgefield won praise for its successful farmers’ and craft markets, and the strong adventure and outdoor tourism ethos. The 50 goals Sedgefield met include promoting local heritage, preserving traditional food, promoting “leisure and pleasure”, and urban planning. It all comes together in the annual April Slow Festival in the town. Knysna Elephant Park was born out of the memory of the hundreds of elephants that used to wander the coastal forests here, most of them now felled. In 1994 Ian and Lisette Withers set up a free-range sanctuary for elephants Harry and Sally, moved from Kruger Park. They live alongside other rescued elephants from the sub-continent, wandering and browsing as they would in the wild. The Withers have created one of the leading centres for elephant management in Southern Africa. There are big, bold, outdoor challenges all along the route. It’s the South African style. Start high, in the Tsitsikamma Reserve, with a thrilling trip through the top of the forest on a network of treetop platforms and cable slides. Go higher still, abseiling and paragliding around the town of Wilderness, to perhaps sky diving at Mossel Bay. But for a full-on hurricane of adrenaline, nothing beats the Bloukrans Bridge bungee jump at Tsitsikamma, from one of the world’s tallest single-span arch bridges. It is billed as the world’s highest bungee — 650 feet above the river. “Pendulum bungee technology” ensures you a “smooth and comfortable jump.” Come back to earth in the Cango Caves at Oudtshoorn, gigantic caverns with stalagmite formation. There’s excellent surfing, and diving on the beaches at Victoria, Buffalo, and Herold’s bays.